I am always on the lookout for new potato recipes. I try to stay away from the ones that involve any frying, but this one was just too tempting. 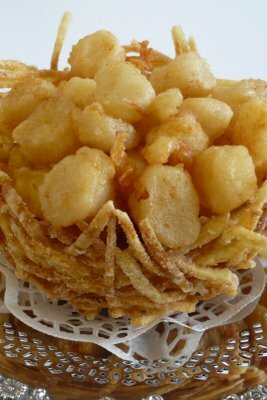 Nests made out of fried potatoes and filled with scallops. I can hear my mom “Now what do we have here?” Meanwhile, my dad will have already eaten half the nest. The scallops are coated in a delicate tempura mix, also fried and served with a lemon pepper sauce. Good thing it is a special day and everyone is allowed to indulge. I stumbled onto this recipe at Kits Chow. I love how neatly this recipe is laid out in numbered steps. 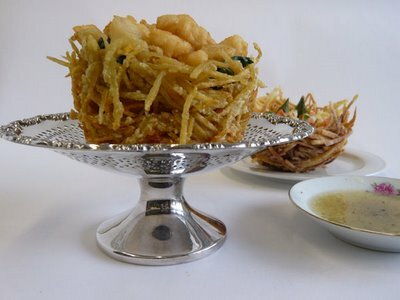 It looks like you will need a bird’s nest fryer for this recipe. I came up empty handed after searching my mother’s packed kitchen drawers, but I did find a very affordable one at Parker’s Pantry. Peel the potatoes and place them in a bowl of cold water. Put the potato sticks, once they are cut, back into the bowl of water. Rinse the potatoes to remove the excess starch. Drain them well and dry thoroughly with paper towels. Place the potato sticks in a bowl and add the salt and cornstarch. Mix everything together. Put the oil in a deep-fat fryer or a pot and heat the oil until it registers 375°F. on a deep-fat thermometer. The oil should be the depth of the fryer and a bit more. Place the potato sticks in the large basket and press the smaller basket over it. Submerge the bird’s nest fryer in the very hot oil. Fry for about 3 minutes, or until it is crisp, golden, and cooked through at the bottom. Drain and take the bird’s nest out from the strainer. Continue making the nests with the remaining potatoes. Sprinkle all the nests with the salt, and keep them warm. Rinse and drain the scallops. Put them in a bowl and sprinkle some white ground pepper over it. Mix well. Put a cup of dry batter on a plate (a pie plate works well) and pour the scallops into the flour. Lightly toss the scallops in the mix until they are coated. Fry them for a couple of minutes in the pan of hot oil after you have made the potato nests. Drain and set aside on a rack lined with paper towels. Put the lemon juice in a bowl and crack some pepper over it. Crack as much or as little pepper as you please. Stir the juice to mix the pepper. This was written by admin. Posted on Wednesday, June 10, 2009, at 5:21 pm. Filed under Reception. Tagged Recipes. Bookmark the permalink. Follow comments here with the RSS feed. Post a comment or leave a trackback.